"Fortunato." A writers group assignment that weaves five D words: dryasdust, dingus, dotard, dystopia, and dolichocephalic. "Mr. MacDonald's Garden." A story based on the J. E. H. MacDonald painting, The Tangled Garden. 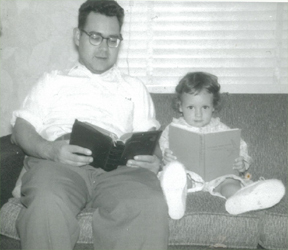 Corinne and her father Lewis, "reading" together, early on. She couldn't yet read or even understand her mother's bird identification book in her hands. But she still owns the copy.